Fall is all around us – celebrate it by making some seasonal treats for your dog. 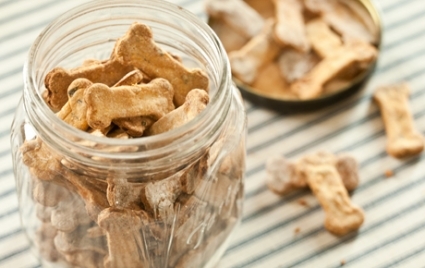 Here are some simple dog treat recipes that take advantage of the Fall bounty. And the great news is, that because these treats are home made with real ingredients, you can snack along with your four-legged friend, should you feel so inclined. 6. 3- Ingredient Homemade Peanut Butter Pumpkin Dog Treats. 8. Harvest Pumpkin Ball Dog Treats. 10. Venison Dog Jerky. You may have venison from the recent deer season that you’d like to share with your pup. Venison Dog Jerky Recipe from greatvenisoncooking.com. Dogs of the Medieval Fair, Humboldt, CA. Popular Dog Breeds – New From Shepherds Grove Studio!